You might be thinking as why I have added ‘Almost’ here. The reason is – Coffee world is huge and endless. There are people always trying and blending new combinations. So, we can’t write about each and every type of coffee drink but have tried to get closer to almost all. Coffee has many flavors and can be easily said countless. Beans from every region has different taste and varies with coffee origin, roasting and preparation methods. Being so much diversified, the coffee preparation is been divided into countless drinks. When we go to popular coffee stores, the menu is confusing if we don’t know these. 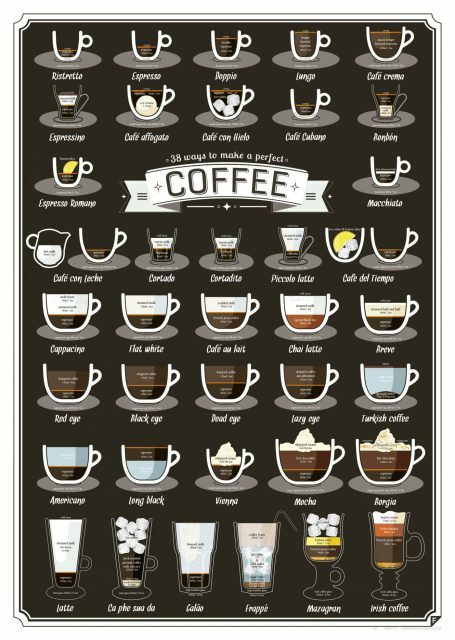 So, let’s have a look on the various coffee drinks and see how many we didn’t knew about. Let’s first know some of the basic drinks that can be easily made at home by a Coffee Maker, French Press or a Pour Over. Most of the American homes are equipped with instruments for these. Regular Black Coffee – The very basic form of coffee that is brewed straight from your Drip Coffee Brewer, French Press, Percolator or a Chemex. If you drink that without adding up anything, its a Black. Black Coffee With Milk – Just add some milk to the Black coffee and the taste changes amazingly. If you are not a Black lover or your taste buds don’t allow that, add some milk. Black Coffee With Milk & Sugar – The combination of Milk, Sugar and Black coffee is a favorite of many. Try this as this is the very basic form anyone can make at home. Turkish Coffee – A tradition of brewing coffee from the Middle-East. In this method, the coffee grounds are dipped into sugary water until some foam is formed. The more the foam, the better the taste. Cold Brew – In this method, the water instead uses cold water in place of hot and is left for a longer time for extraction. Most people leave the preparation over night to have a great cup of coffee in the morning. Now days, many cold brew coffee makers are available in the market to ease the preparation. Iced Coffee – Though the name sounds something as same as Cold Brew, but both have different preparation methods. Here, the coffee is made as regular hot brew and after that it’s served cool. Espresso is a coffee that is now a popular drink. It requires some special equipment, but there are some hacks to make espresso without machine. Anyways, let’s understand what an espresso is and their various types! Espresso – Espresso is the base for other coffee drinks and is prepared by forcing nearly boiling water into tamped fine ground coffee under pressure. 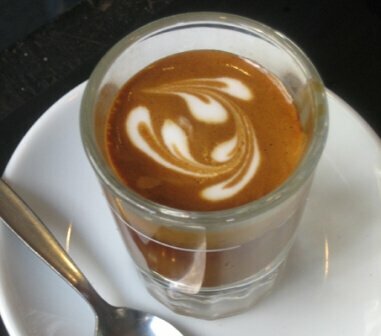 The result is thus a concentrated liquid of dissolved and suspended flavors of coffee with a little crema on top. The size of a basic espresso is 25 ml which can be further classified as single, double or triple shot(25 ml,50 ml or 75 ml) according to the strength required. As it was further stated, it is the base of other coffee beverages like; Cappuccino, Latte, Mocha, Macchiato and Americano. Espresso gained its popularity in the 1980s but at that time it was just available in the stores only. Lately, home brewing equipment were made to ease the coffee lovers have their favorite drinks at home. Now days, many equipment are available online as well as in the stores. Ristretto – This is a strong form of Espresso that is made with the same amount of coffee grounds, but extracted with half the amount of water in same time interval. The grounds here used are extra fine resulting in a concentrated shot. Doppio – It is a double shot extracted via double coffee filter in a portafilter. Now days, Doppio has become a standard drink in place is a normal espresso. Americano – The last major variation of coffee was derived in America were people love strong coffee. 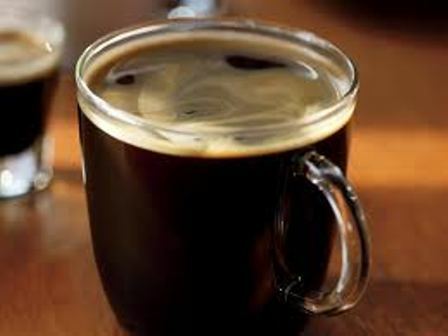 The Americano is prepared by adding hot water to a single or double shot of espresso as required. This coffee is famous in America and slightly in nearby areas. Lungo – Lungo is often confused with Americano, but it’s not at all the same. Lungo is a long shot prepared by extracting double the amount of water with same amount of coffee grounds. In figures, it means, 50 ml of water is extracted with 7 grams of coffee. This results in extraction of more caffeine, but with dissolved off-notes of coffee. It’s a less popular drink but it’s a preferred drink for people who demand more caffeine. Caffè Crema – An extra long espresso drink served in Northern Italy, Germany, Switzerland and Austria. It has different flavor profile than related drinks like Lungo and Americano due to different extraction process. Rough brewing ratios of ristretto, normale, lungo, and caffè crema are 1:2:3:6 and the average water part per shot is 6 oz (180ml). Café Zorro – This is a double shot of espresso that is added to water in a 1:1 ratio. Café Cubano – Originated in Cuba, this drink is also known as Cuban Espresso. This is actually an espresso shot sweetened with by demerara sugar whipped with first and last drops of espresso. Café con Hielo – Coffee in Espresso are some different and this drink is one among those. If you will order this coffee in Spain, you will be served a cup of espresso with another cup of ice cubes and sugar. To start with, add sugar to espresso as per preference, and stir to dissolve. After that, pour the coffee over ice and here is your Café con Hielo. Moka – A coffee brewed in a Moka pot is often known as Moka cup. Though it’s called an espresso, but in true words, it’s not. The pressure in the pot is very less as compared to that of an espresso machine. Now let’s know about the Specialty drinks that have base as Espresso and with some add-ons. They make up some amazing and delicious cups that are fancy and attractive. A super-automatic machine adds a lot of convenience to prepare these kinda drinks. Cappuccino – Introduced in 17th century by Italians, Cappuccino has gained immense popularity in the whole world. All the baristas and coffee bars have this drink at the top of their menus. It is generally a combination of an espresso, hot milk and steamed-milk foam. The bottom 1/3rd of a cup is filled with espresso shot followed by next 1/3rd with hot milk, and the last portion with steamed milk foam produced by steam producing espresso machine. Latte – The actual name of Latte is Caffelatte which got shortened with time and now known as Latte. Latte is generally a combination of espresso shot and steamed milk. The standard drink is of 1/3 cup of double espresso shot and 2/3 portion of steamed milk. The top is decorated with latte art which can be easily done by steamed milk with few practices. The milk dominant in Cafelatte as the portion is high here. It is a marvelous drink and is been loved all over. Piccolo Latte – Often known as Baby Latte, a Piccolo is a Ristretto shot of 15-20 ml topped with 60 ml steamed silky milk and foam on top. 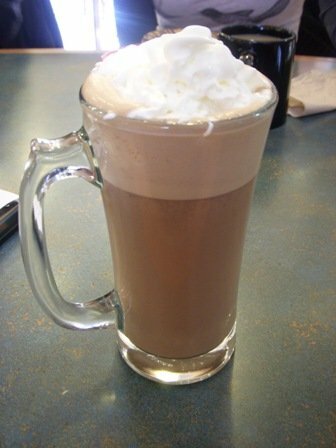 Mocha – This is the drink for chocolate lovers. Mocha, which is originally Mocaccino was derived in the coastal town Mocha, Yemen. The drink resembles Latte with an addition of chocolate in the form of either syrup or sweet cocoa powder. They generally contain milk froth on top as in Cappuccino. There are many varieties of Mocha with variations in chocolate flavors and most common are the dark and white chocolate Mochas. Macchiato – Cafe Macchiato is prepared by adding a spot of foamed milk to an espresso shot. The spot of milk can be said as little milk or just a hint of milk to change the taste of a plain espresso shot. The top can be decorated with a latte art to make it look good. The very well known place for Macchiato is Ethiopia where the best of this drink is made. Cortado – An espresso shot served with just a small splash of milk. It’s a Spanish drink also known as café manchado in some parts. Cortadito – Cafe Cubano added with warm milk in 1:1 ratio is Cortadito. This term is often confused with Cortado but they have a slight difference. Café Bombón – Espresso with sweet condensed milk is referred to as Cafe Bombon. For sweet tongue, this is a great drink to try. Cafe Con Leche – An espresso shot served with separate hot milk. Usually, hot milk is added in 1:1 ratio of espresso. Carajilo – Espresso served with alcohol and no milk is Carajilo. It’s a Spanish form of coffee popular over there, but now some other parts of the world too. Espresso Romano – An espresso with some twist of lemon is called Romano. A proper way to best taste this drink is – add some lemon juice at the bottom of your cup and rub the lemon around the rim. Then drop the espresso shot to taste the different side of coffee. Espressino – This is a drink made with equal parts of espresso. Cocoa powder is added at the bottom of cup and over the final shot. A layer of nutella is also spread on the walls of cup. Flat White – A double shot of espresso with steamed milk in a ratio of 1:2 is Flat white. There is no layer of milk foam on top of this drink. Café Au Lait – Different from other drinks, this drink has base as regular coffee made via Drip or French Press. Then steamed or hot milk is then added in same ratio. Caffe Breve – This is an American variant of a latte: a milk-based espresso drink using steamed half-and-half mixture of milk and cream instead of milk topped with foam. Antoccino – A single shot of espresso topped with steamed milk in a ratio of 1:1 is Antoccino. Cafe Affogato – Can be said as Italian coffee or dessert. It’s prepared by pouring espresso shot over a scoop of vanilla gelato. Black Eye – Double shot of espresso topped on a cup of drip coffee is Black Eye. Dripped Eye – Three shots of espresso topped up on a regular coffee cup is Dripped Eye. Lazy Eye – Two shots of espresso topped over a regular cup of Decaffeinated coffee is Lazy Eye. Vienna – Here, milk is replaced with cream, so it’s basically a cream-based beverage. The preparation involves infusing whipped cream over two standard shots of espresso until the cup is full. Café Borgia – Something like Mocha preparation, this drink involves espresso, than hot chocolate, whipped cream and some orange zest at top. Instead of chocolate shavings, orange zest provides some citrus touch to the drink. Cha Phe Sua Da – Finely ground Vietnamese-grown dark roast coffee is individually brewed by a metal french press drip filter into a cup containing about quarter to half condensed milk. It is than stirred, and ice cubes are poured over. Galão – A hot drink from Portugal in a combination of espresso and foam milk. About a quarter of glass is fillet with espresso and is topped with foam milk for the rest of 3/4th cup. Frappé – It’s a Greek drink that is made by stirring Instant coffee granules with a small amount of water. Then a little sugary water, cold water and ice cubes and after that some milk foam is added. Mazagran – A Portuguese drink, made by pouring hot French press coffee over ice and infusing a lemon slice. Irish Coffee – A coffee, more specifically French Press coffee with half ratio of Irish whiskey and topped with some heavy cream. Guillermo – Two espresso shots are poured over lemon slices and topped with some ice cubes. 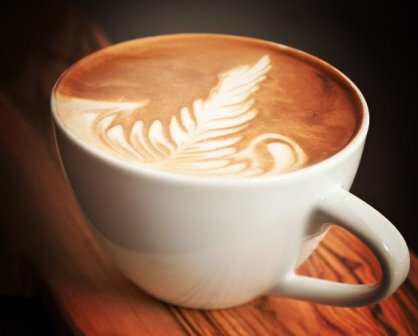 The above were all the major variations of coffee drinks which are popular throughout the world. There are varieties in all of them and that is what constitutes a Café Menu. Hope the article has increased your knowledge about coffee. Any feedback or questions are welcome through the comment section.